Cyprus has been a divided island since 1974. The north, which is not internationally recognised, is governed by Turkish Cypriots and is effectively under the control of Turkey, The southern (Greek) part, the Republic of Cyprus, is a member state of the European Union. The two parts are separated by a demarcation line that also runs through the middle of the capital city Nicosia/Lefkoşa and is controlled by the UN Peacekeeping Force in Cyprus (UNFICYP). The island, which was part of the British Empire until 1960, has two military bases: Akrotiri and Dekelia. They are internationally recognised as exclaves of the United Kingdom. Strictly speaking, the island is divided into five areas. English still remains a lingua franca, with Greek spoken in the south and Turkish in the north. The colonial era still leaves a visible mark on many everyday regulations. For example, on both sides of the division people drive on the left-hand side, as in the United Kingdom. 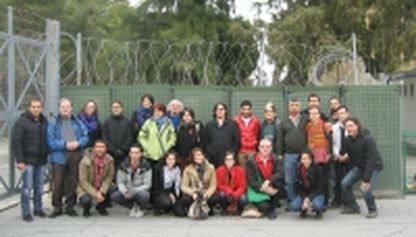 The Mediterranean Conference on Conscientious Objection took place in the capital city, in the middle of the buffer zone. The Cyprus Community Media Centre (CCMC) provides organisations from both sides with conference and project rooms in this zone. There is a good reason for this. The buffer zone can be reached by everyone on the Island via the checkpoints located on both sides. The Goethe-Institut, which offers German-language classes and other courses, also happens to be there. The fact that the conference location can be reached from both sides of the island was an important reason for holding the Mediterranean Conference on Conscientious Objection there. It is considerably easier for Turkish nationals to reach Northern Cyprus, since this area is effectively governed as Turkish territory. The southern part, being a member state of the European Union, was accessible to many without a visa – or they were able to acquire a visa. However, a number of people were unable to come. In both Egypt and Turkey, conscientious objectors are subjected to a “civil death”. They have no passport, no access to education or training, they cannot open a bank account and without a passport they cannot go abroad. Some activists from Palestine were also unable to come, since they did not acquire an exit permit under the Israeli occupation. Furthermore, two conscientious objectors from Greece were prevented from travelling because the Greek border authorities deemed them to still be liable to military service. Even having reached Cyprus, the participants were faced with restrictions. Most of the Turkish delegation spent the night in the northern part of the island and were unable to cross the demarcation line because they did not have EU passports. The rest of the participants were in the southern part of the island, but they were at least allowed to go to the north as well, meaning that they could all still spend the evenings together. The idea for the conference came about roughly a year and a half earlier at a seminar in Istanbul. In many countries in the region, conscientious objectors, including Israeli women, are threatened with recruitment and prosecution. Wars, occupation and militarised societies are on the daily agenda. The conference should allow initial exchange and the chance to develop joint projects. The conference began with country reports in order to make the situations in different countries clear. The delegates from Greece spoke of the persecution of conscientious objectors, which began again in 2013. Six of the objectors were arrested last year, some because of old accusations, others due to new conscription regulations. Almost all of the lawsuits resulted in suspended sentences by military courts. Some objectors also received a fine for withdrawal from military service, which has amounted to € 6,000 per head since 2010. Furthermore, the committee responsible for examining claims is rejecting more and more requests for conscientious objection. The movement No to Compulsory Military Service from Egypt reported on the precarious situation currently experienced by three objectors of the group. Since they did not follow conscription orders, they are now liable to “civil death”. They cannot take up employment, study or acquire a passport, and therefore cannot leave the country. Furthermore, they are threatened with recruitment and prosecution. Since the military took over power it has been extremely difficult for the group to continue working. They are not officially authorised and also do not receive any support from other parties or organisations in the country. Therefore they made it clear that international support is very important for them in terms of being able to continue pursuing their objectives. They are calling for an end to conscription and, as an initial step, the possibility of carrying out civilian service. Onur Erem, a member of the Association to Conscientious Objection from Turkey (Istanbul), explained that in total one million people have withdrawn from the military. Just like conscientious objectors who publicly declared their refusal, they are faced with “civil death”. Furthermore, they are repeatedly subjected to criminal proceedings since they can be conscripted again after each criminal proceeding. (...more) The association demands an end to conscription and, as an initial step, the recognition of conscientious objection. Gürsel Yıldırım, active in Hamburg, added to this with information on the administrative fee of 6.000 € for Turkish nationals living abroad on a long term basis. Anyone who is not prepared to pay this conscription-related head money is effectively not allowed to travel to Turkey for a longer time. The Republic of Cyprus, as a member state of the European Union, recognises conscientious objection and has a regulation very similar to the Greek model. While military service lasts 24 months, the length of alternative service amounts to 33 months. The government refuses to publish information on the number of applicants. In the north of Cyprus there is no right to conscientious objection. After being recruited into the Cypriot army, draftees are essentially subjected to the command of the Turkish army based in Cyprus. The Initiative of Conscientious Objectors, founded in 2007, successfully obtained a preliminary suspension of criminal proceedings against conscientious objectors. This was obtained through a proceeding in the constitutional court. In the proceeding against Murat Kanatlı, the constitutional court also reasoned that conscientious objection, according to the judgements of the European Court of Human Rights, was to be seen as part of the Convention on Human Rights. The constitutional court remitted the case to the military court. The day after the conference, the proceeding took place, which a representative each of the Turkish association and of Connection e.V attended. Public prosecutors as well as the defence brought forward their arguments. The rendition is to take place on 23 February 2014. Many successfully manage to escape military service by withdrawing, meaning that only around 40-45% of Israeli citizens of serving age carry out the full period of service. However, there are only a few who publicly declare their conscientious objection, and in most cases objecting to occupational policy. By declaring conscientious objection, they risk repeated custodial sentences, each lasting one week. Naom emphasised the insight of New Profile, namely that those who withdraw from the military are to be seen as a part of the resistance to the military. New Profile also believed it necessary to develop a policy for conscientious objection that takes into account withdrawal from the military. Therefore New Profile always offers comprehensive consultation that includes the different possibilities (and consequences) regarding withdrawal from the military. The representatives of the Druze Initiative Committee, a Palestinian group from Israel, showed a recently made film in which objectors have their say. As Druzes, they are also liable to military service in Israel. They refuse, viewing it as part of the occupation. Even though they live in Israel, they view themselves as victims of the occupational policy and they pointed out that their village alone has lost 85% of its land in the last few decades. Druze conscientious objectors are generally subjected to even stricter oppressive measures when prosecuted than other conscientious objectors. Through the reports it became obvious that there is a whole range of similarities in the different countries. Conscientious objectors are subjected to repression and prosecution in different forms. The military and police maintain occupation, injustice and the oppression of minorities in highly militarised societies. International law is disregarded. However, the participants also noticed differences. In some countries there is, at least formally, a right to conscientious objection. In others this is completely absent. A further peculiarity that particularly applies to Turkey and Israel: in these countries, members of minorities or sections of the population suffering under occupation and oppressive policy are recruited into an army of the ruling forces. The recruits in this group who object by withdrawing or resisting regard their action as a protest and resistance against this policy. A lot of time was spent on the question of whether or not to create a common declaration at the conference. A draft was quickly drawn up, but in the very long discussion it was not possible to agree upon different political ideas, as Ercan Aktaş highlights in his contribution (...more). Ultimately the pitfall was the question of what forms of resistance against occupation were acceptable. While some people did not want to rule out forms of violence and did not regard themselves as pacifists, others insisted on exclusively non-violent approaches and actions, of course including conscientious objection. Even if one stance could not be found: the discussion was crucial to gaining a better understanding of each other and appreciating the backgrounds of those with different stances. Therefore, in the end, the participants agreed to continue their collaborative work despite all differences. A website is to be created, in which the contents, actions and urgent actions for conscientious objectors from the participating countries are to be published. Reports on the persecution of individual conscientious objectors are to be compiled and submitted to international bodies by lawyers as complaints. An e-mail group will be created in order to further discussions and exchange information. Reports on actions and ideas are to ensure that these actions and ideas are also explored in other countries. An international day of action is to strengthen the common demand for the abolition of conscription and the recognition of the right to conscientious objection. However, the most important thing, in my view, is the personal contact that occurred during the days of the conference. It was clear that mutual interests were formed and relationships were established. Ultimately, these are the key requirements for the success of a Mediterranean Network for Conscientious Objection. Rudi Friedrich: Mediterranean Conference on Conscientious Objection – Report. 10 February 2014. Translation: Richard Meakin. We are thankful for financial support by AJ Muste Fund (USA), American Friends Service Committee and Bewegungsstiftung.